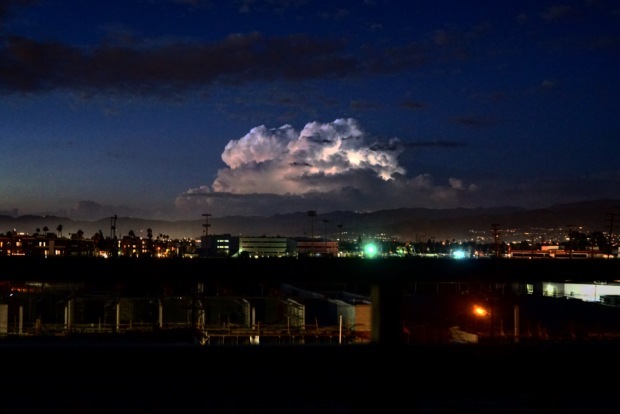 Thunderstorms moved into desert areas east of Los Angeles Wednesday afternoon as monsoonal storms continue to usher warm and humid air into Southern California ahead of the holiday weekend. Weather Photos: Visit us on Instagram to see what the NBC4 Weather Team is sharing on #WeatherWednesday. At midday, a storm system was moving northwest through the Hemet, San Bernardino and Riverside. The system might bring rain to the Los Angeles area early Wednesday afternoon. "I'm watching whether this could build a little off to the south," said NBC4 forecaster Anthony Yanez. Showers and thunderstorms are possible in the mountains and deserts through the week. "The continued warm and humid air will set off a few thunderstorms again today," said NBC4 forecaster Crystal Egger. "Remember there is no safe place to be outdoors when lightning strikes so stay alert." Across the rest of Los Angeles County, showers could continue into Wednesday, with rain hitting the morning commute in the Inland Empire. Meanwhile the heatwave gripping SoCal has led to the management of the state's energy grid has issued a "flex alert," with residents urged to conserve electricity between 2 and 9 p.m. Wednesday to reduce strain on the system. The alert went into effect Tuesday and was to remain in force today, the California Independent System Operator said. Monsoonal storms moved across Southern California Tuesday and overnight Wednesday, bringing thunderstorms, dangerous lightning and hail. Due to lightning strikes, most LA area beaches were closed before 5 p.m., including Catalina, Cabrillo, Redondo, Hermosa, Manhattan and others, according to Supervisor Sims with LA County Fire Department. Several Orange County beaches were also closed. 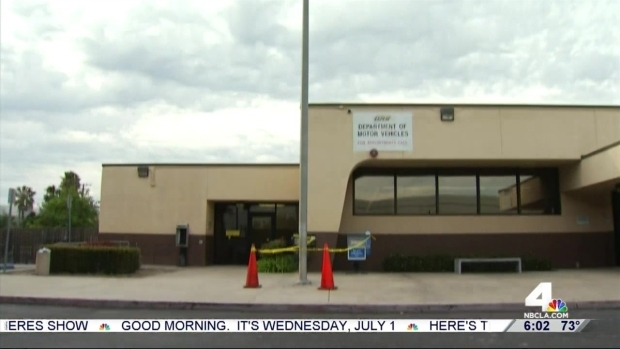 Lightning also struck overnight in Needles at around 12 a.m. and in Blythe at around 1 a.m. There was a close call in Torrance, where lightning struck a lamp pole outside a DMV center while people stood outside. A hole was left in the concrete where the electricity struck the ground. "I heard a really big... boom. I saw all this lightning here and... people went on the floor," a witness said. A man who suffered a panic attack following the strike was taken to the hospital for observation. Download the NBCLA app here for the latest forecasts.